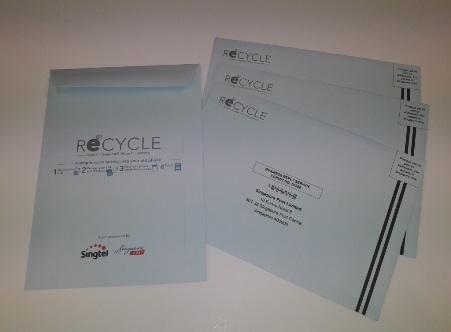 In line with World Environment Day yesterday (June 5), Singtel has teamed up with SingPost to launch a nationwide recycling programme. Called ReCYCLE, this initiative is Singapore’s largest electronic waste (e-waste) recycling programme by reach; and it encourages people to dispose their redundant mobile or Internet-related devices at ReCYCLE bins or by mailing them through any post box. Examples of the electronic waste include mobile phones and charges, laptops and tablets, modems and routers, as well as other related accessories like lithium batteries and cables. Under this programme, members of the public can dispose their e-waste at selected Singtel shops, Singtel exclusive retailers, and Post Offices with a ReCYCLE bin. Alternatively, one can collect special ReCYCLE envelopes from any of the eight Singtel shops, 58 Singtel exclusive retailers, and 57 Post Offices located across the island. They can then “mail” their recyclables through any of the post boxes in Singapore for free – the postage fee is waived. But Is The Data In My E-Waste Safe? One important question when it comes to e-waste recycling is this: Will the data in my e-waste be safe when sent for recycling? Yes, your data’s safe and secure. Singtel and SingPost assures that their e-waste recycling partner, Cimelia, is a reputable and NEA-licensed company; and as part of their corporate governance, they undertake proper recycling of all storage devices collected. All storage media devices like SIM cards, memory cards, USB flash drives and hard disks will be consolidated until a substantial volume is collected. They will then go through a crushing process for secure destruction. According to the National Environment Agency, Singapore generates more than 60,000 tonnes of e-waste every year. This is as heavy as 220 Airbus A-380 planes! Since e-waste is one of the fastest growing categories of waste, there is a need for a proper avenue for its disposal because most e-waste is still finding its way into landfills, which pollutes the environment. Ultimately, this programme reduces waste as it ensures that the valuable metals and components the devices contain get recovered and a new lease of life. Otherwise, e-waste that is thrown away, including all the precious metals that it contains, will be incinerated and become landfill in Pulau Semakau. “With our partnership with SingPost, we’ve gone a step further to bring convenience to everyone by doubling our reach and touchpoints. 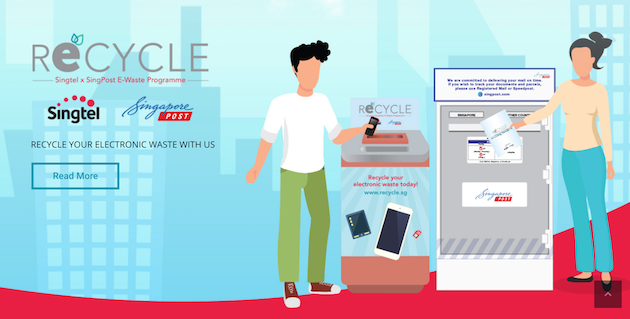 We hope this will encourage more people to recycle and think twice before disposing their electronic devices down the rubbish chutes,” said Andrew Buay, Singtel’s Vice President for Group Sustainability. “This is a programme that addresses an environment issue which affects our community. 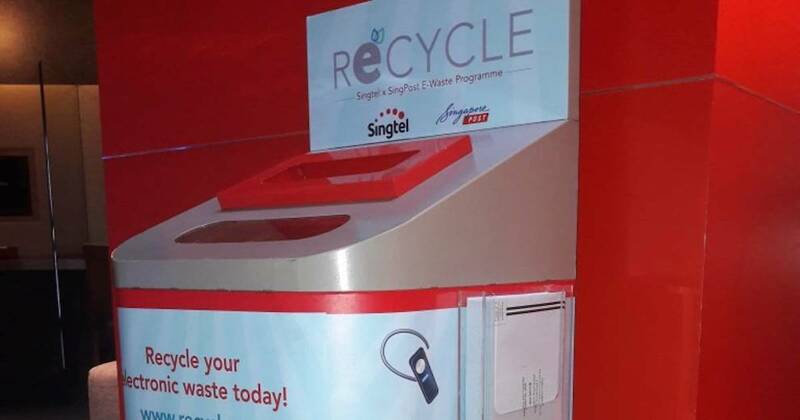 Working with Singtel creates greater impact across Singapore for ReCYCLE. We hope to provide our postal network capability to help people recycle more e-waste. Every recycled item means one less piece of waste that ends up in the landfill,” added Selena Chong, SingPost’s Vice President for Corporate Sustainability. For more information on the ReCYCLE programme and list of locations with ReCYCLE bins, please visit www.recycle.sg.